LAS VEGAS -- It didn't take long for Real Deal Poker's Rob Gallo to think of a natural spokesman for the new site. The spokesman would have to be visible. He would have to stand out and attract a crowd. A catchy nickname would work wonders. 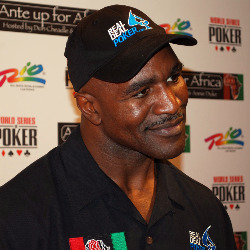 So what better spokesman for Real Deal Poker than Evander "the Real Deal" Holyfield? Real Deal Poker soft-launched on May 7 and prides itself on being the only online poker room that deals "real" cards to simulate online play. Gene Gioia, the founder and president of the site, developed software that uses real cards to automate game play. "We do something nobody thought was possible," he said. "We deal real cards scalable to an RNG." Gallo, the owner of online firm Peak Marketing, knew that in order for the new site to come into a very competitive market, it needed a hook. And that's where a former world heavyweight champion boxer like Holyfield comes into play. "The idea was the fight to bring real poker online," he said. "We're not idiots. We realize getting into the business is mammoth. The perception for online poker is obviously PokerStars, Full Tilt Poker and Party Poker. For a new breed to come in is a daunting task. "So we're going to use the fact that we deal real cards and if that doesn't convince you we got Evander Holyfield to knock you out." 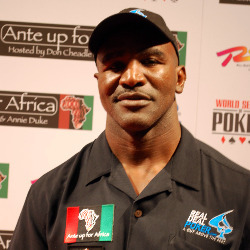 Holyfield made his poker debut at the Ante Up for Africa charity event held before the start of the Main Event. He said he stuck around for awhile but wasn't pleased with how he finished. "I stayed in for a long time, but I have this thing that if you don't win all the marbles, you don't win," he said. He did not compete in the Main Event, but did make an appearance on Day 1A outside the Amazon Room. It wasn't difficult for him to draw a crowd. "'Real Deal' is who I am," he said. "Like today, if you would have told people, 'Bring Evander onto the poker thing and have him take pictures there.' How many people do you think would say, 'I don't know, I don't think he's hot (anymore).' We get out here and they had to stop it because there were so many people taking pictures." Gallo estimated people took 600 pictures of Holyfield, and by the time tournament officials told them to move, Real Deal Poker had given out almost 1,000 patches. That's why it wasn't uncommon to see Main Event players patched up with the Real Deal logo, even though the site has been live for less than three months and isn't even open for American players. The poker room is in the midst of its first major promotion, which is dubbed "Beat the Champ." The site is holding satellites in "lightweight" and "middleweight" divisions. Those who move up to the "heavyweight" division then compete in a tournament for the grand prize: a chance to play Holyfield heads-up on September 2 in London's Leicester Square in a boxing ring. It's taken awhile for Real Deal Poker to reach the point where "Beat the Champ" was possible. Gioia became involved in the online gambling business in 2005 "out of frustration" after working as an IRS agent and other various jobs in the accounting and auditing field. "We did a survey almost five years ago and asked people who didn't play why they didn't play and what would cause them to play," he said. "Over 50 percent said their number one concern was fairness of the games dealt. About 30 percent said they would play if there was a system in play that guaranteed fairness of the game. That was the information that I got that made me decide there was a market for this." He then developed a system called "Cut N' Shuffle," which eliminates RNGs. The player with the button actually cuts the cards by sliding his or her mouse across the deck and choosing a spot. "In dealing real decks of cards (we) have some distinct advantages over an RNG," he said. "By using physical cards, you're working with the objects, not the value associated with them...You create a system that's less apt to the subject of manipulation." He originally wanted to be a third-party dealer of the technology. However, no sites took him up on the offer because they were making money doing it their own way. Gioia said the demand for sites like Real Deal Poker is out there and the room's ability to audit their results helps ensure the fairness players are looking for. "My way of thinking is sooner or later you're going to have to have absolute protection over people's money," he said. "It's the way the system should be. You want to ensure the integrity of the game, and make it virtually impossible for anybody to cheat." Gioia says the room gets about 500 players during peak hours. Holyfield isn't one of them. He said he doesn't play online at the moment but will be working on his game in anticipation for the London event, and ultimately thinks his boxing experience will help him at Leicester Square. "I think like a poker player," he said. "Poker is all about out-thinking your opponent. You don't cry about it and you make a decision. I didn't become a five-time world champion by not making a decision. Poker is the lifestyle I live." Holyfield, Real Deal Poker a natural match is republished from Online.CasinoCity.com.